Welcome to our emporium of furniture, please come on in and make yourself at home. We are like a nice lavish copy of your favourite magazine to leaf through, we've been selling great furniture at fair prices for over 35 years, no shopping cart and algorithm can replicate that. To order or discuss just pick up the phone or bash off an email. We are always happy to talk deals on a few pieces, call us anytime 24/7 and you'll get someone who lives and breathes furniture! It's not all about price online, sure that is important of course, but if you can actually get some personal service and advice from someone who knows furniture, that's our bonus for you! Especially if you can just call them anytime you like. There is everything from the finest English bespoke handmade leather sofas to ornate chandeliers, Roman Stone statues to weathered oak dining sets, beautiful pocket spring beds filled with cashmere and pure wool to vast library bookcases. Stunning designer contemporary copper, gold and cutting edge chrome pieces. 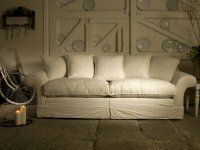 We have gorgeous TETRAD shabby chic pure cotton loose cover sofas and new replacement loose covers, vintage and retro leather sofas and have you seen the new ultra contemporary vibrant FF Collection by Tetrad? Check out our dazzling lighting selections, unique contemporary table lamps and traditional table lamps, desk lamps, ceiling lights, floor standing lights and outrageous chandeliers, amazing mirrors and classic and contemporary wall clocks. Mix in some exciting designer cutting edge contemporary pieces and you can create a really exciting unique look in your home. We deliver to Ireland, North and South on a regular basis, right up to the top of Scotland, down to Cornwall and everywhere in between, lots in London of course, Mayfair to Hackney! Will it fit? Can I get samples or more pictures? How long for delivery? How about a bit more discount if I buy more? - Try that with a robot shopping cart! Talking about lead times..........A lot of pieces we can arrange 24/48 hour delivery by courier if you are in need of finishing a project ASAP, that includes everything from a light fitting to a Chesterfield leather sofa, it's a great service for the interior professional and interior designers. We try to offer competitive prices for all our customers and free home UK delivery, should you find a high street shop or online retailer offering the same goods for sale we would appreciate the offer to better any price match. We also deliver to Europe. To place an order just call us on 01704 548176. Full range of Tetrad Heritage and contemporary FF furniture! Tetrad loose cover sofas, fixed cover sofas, leather sofas, fabric sofas and chairs and leather chairs. Huge selection of Tetrad furniture to view in store. We also offer the full range of original Tetrad replacement loose covers for sofas and chairs. FREE delivery on Tetrad sofas and other Tetrad furniture! Click on the image or link above to see our Tetrad sofas and chairs. Our main furniture ranges featuring upholstery, oak and pine, acryclics, mirrored, painted, reclaimed, chromed, gilt and gold! We also have Orientals, French, Italian and Empire ranges, outlandish wall mirrors, clocks and garden pieces and lots more. Over 30 stunning collections updated weekly with the latest pieces. Fabulous furniture all a bit different from what you'd usually find in the high street. Quick despatch available on many pieces. Click on the image or link above to see our Country House furniture ranges. Our 2019 URBAN contemporary furniture collections include Henley walnut veneer, Japanese Minimalist, Shard white high gloss, HI-TECH Chrome, Bombay Blue, Campaign Nauticalia and mirrored collections plus lots of contemporary sofas, armchairs, easy chairs, dining furniture, occasional tables, mirrors, trunks and trunk style furniture. The contemporary collections also include an eclectic selection of home accessories and modern lighting including table lamps, office desk lamps, chandeliers, floor standing lights, wall lighting and rugs. Click on the image or the link above to view our URBAN contemporary furniture. The FF Collection by Tetrad offers the finest ultra contemporary fixed cover sofas, snuglers, chairs and stools. With a wide choice of quality textiles and a modern pulse, the FF Collection by Tetrad delivers vibrant individual pieces. FREE delivery on FF Collection by Tetrad. Click on the image or link above to see our Tetrad FF Collection. 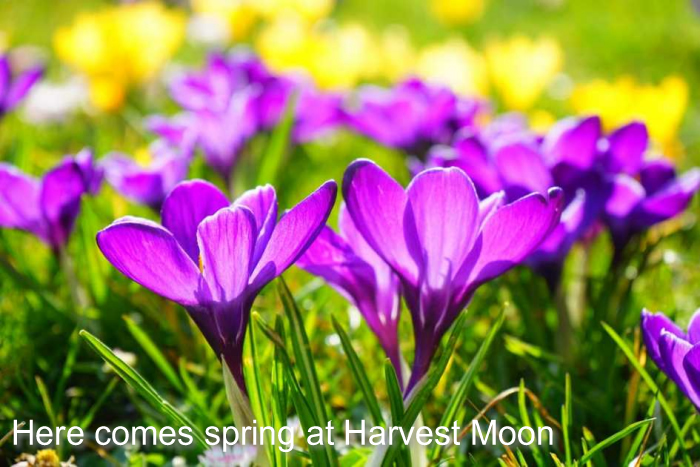 Table lamps, chandeliers and lots of other exciting lighting are now available to buy at Harvest Moon. Lots on lights on display in store. We've got classic table lamps, contemporary table lamps, classic and contemporary desk lamps, wall lamps, ceiling lamps, contemporary floor standing lamps, classic and contemporary chandeliers for you. Click on the image or link above to see our lighting range. Finest English bespoke upholstery handmade to order including bespoke sofas, armchairs, sofabeds, day beds, chaises, office chairs and occasional chairs. Artistic Upholstery furniture is available in any of the traditional or modern upholstery fillings and finishes. Most pieces are available in a wide range of leather or fabric options. Pieces can also be made in the customer's own materials and in bespoke sizing. FREE delivery! Click on the image or link above to view Artistic Upholstery furniture. Jay-Be have a new range of luxury fabric sofa beds and folding beds and as Jay-Be stockists we've got the lot for you. Choose from 6 luxury fabric sofa beds including classic, modern and retro sofa beds, a retro sofa bed chair and a footstool bed. Each model is available in luxury woven fabric with 20 colour options. Suitable for everyday use. FREE 2 man delivery including assembly. Next day delivery on folding guest beds and Contract folding beds. Click on the image or the link above to view the Jay-Be range. Lots of different painted furniture collections including white, cream, grey, black and aquamarine blue collections plus green, orange, pink, purple, red and yellow painted furniture pieces all in one place. Most ranges are from our Country House collections including the very popular Parisienne and Florence and we also have Bretagne from Charltons Furniture and Cheltenham from Corndell. Click on the image or link above to see the ranges. The very best vintage leather sofas and mixed leather and chenille sofas including classic comfy leather sofas, leather Chesterfields, leather chairs, leather ottomans and a big range of gorgeous leather chairs and armchairs. Classic fabric and contemporary leather and fabric sofas and chairs and also available to order. Lots of pieces in stock for quick delivery. 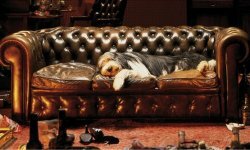 Click on the image or link above to see the classic and vintage leather sofas, chesterfields and chairs range. Luxury handcrafted Cotswold Pocket Spring divan beds, mattresses and headboards all made right here in the UK. Luxury single to super king size pocket spring beds with superior fillings including pure white cashmere, silk, wool, cotton, mohair and horse hair with medium, firm or dual tension options. Nationwide 2 man delivery to the room of your choice. Click on the link or image above to view the Cotswold Pocket Spring bed and mattress range now. Our capsule Eden collection from Sweet Dreams the UK's best middle of the road bed manufacturer. Great value, well made in the UK, guaranteed to give you a great snooze. There are four complete beds, all pocket sprung, all with choices of 2 or 4 drawers, ottoman etc. and you can order the mattresses on their own. FREE rapid 10-14 days delivery! Click on the link or the image above to view the range. We stock Corndell Cheltenham oak and painted oak bedroom furniture, a range inspired by elegant French furniture. Available in complete white oil oak finish or a choice of six hand painted colours with oak tops, along with a choice of handle options. The natural wood grain is visible through the hand applied paint if you choose one of the painted options. FREE delivery on Corndell orders over £750! Click on the image or link above to see our Corndell Cheltenham bedroom furniture collection. The Empire furniture collection is a collection of reclaimed / old pine furniture. 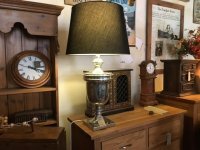 Over 50 pieces to choose from some with carved detail including a full range of old pine bedroom furniture and old pine dining furniture. Also living room seating, occasional tables, bookcases, shelving units and more old pine living room and occasional furniture. FREE delivery! Click on the image or the link above to view the Empire collection. The Florence painted furniture collection features simple clean lines that define this fashionable French furniture range with a contemporary cream painted, grey painted, white painted or black lacquered finish. Florence is designed for lovers of modern minimalist furniture and includes bedroom, living and dining room furniture. Lots of new pieces! FREE delivery! Click on the link or on the image above to view our Florence furniture. 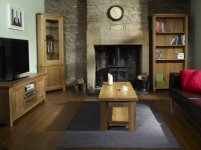 As Charltons Furniture stockists we stock the Charlton modern oak Bretagne and Somerdale furniture collections for the dining and living room. Charltons Furniture is furniture is available in a wide range of natural lacquered, stained or painted finishes. You can mix and match the different options. FREE delivery on orders over £1000! Click on the image or link above to see the Charlton furniture collections.